Mount Jerome Cemetery was originally on the estate of Rev Stephen Jerome, who in 1639 was vicar of Saint Kevin Parish. After other ownerships the General Cemetery Company of Dublin purchased the land for this cemetery in 1834, opening the cemetery in 1836. In 1984 the complete cemetery was purchased by the undertakers Massey. It contains over 300,000 burials. This cemetery is old and many very elaborate stones as well as many worn with decay. It is situated on the south side of Dublin and is fairly easy to reach from Dublin city center by bus. This cemetery is sometimes called Harold's Cross Cemetery. 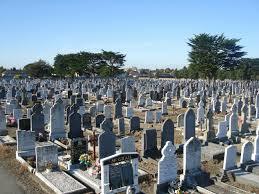 This is not a complete listing of burials in this cemetery! The records below were provided by contributors to Interment.net. Genealogist Pat Deasum [deasum1@shaw.ca] submitted a transcription of records to us on Sep 7 2011 consisting of information he found in British Microfilm. The records appear to be connected to his own personal research. Volunteer Ciara Humphreys [ciaralhumphreys@gmail.com] submitted a transcription of records to us on July 9, 2015, without any explanation of where they came from. Upon inspection, they appear to be based on tombstone inscriptions. Barton, Henrietta, d. 1 Jan 1973, Henry Barton, Henrietta Barton, Jane Eithel Johnston & John Horace Barton all in same grave. Possible relation? Barton, Henry, d. 12 Oct 1938, Henry Barton, Henrietta Barton, Jane Eithel Johnston & John Horace Barton all in same grave. Possible relation? Barton, John Horace, d. 3 Dec 1977, age 97, Henry Barton, Henrietta Barton, Jane Eithel Johnston & John Horace Barton all in same grave. Possible relation? Bell, W. J., d. 1 Nov 1919, age 23, Corporal, Royal Irish Rifles. Alex Bell on same headstone. Dillon, Edith (Edie), d. 19 Jan 1939, Sis/o Mary & Anne, age 45. Dougherty, Anna Gage, d. 12 March 1909, w/o Sinclair Carroll, age 48, Fern Lea Ashdale Road. Gick, Florence Charlotte, d. 28 May 1999, w/o Charles C.
Johnston, Jane Ethel, d. 14 Oct 1975, Henry Barton, Henrietta Barton, Jane Eithel Johnston & John Horace Barton all in same grave. Possible relation? McNeill, Mary E., d. 18 Jan 1959, w/o Robert H.
Ruddock, A. D., d. 23 Sep 1918, age 25, Royal Inniskilling Fus. Scott, Gwendoline Elizabeth, d. 9 Feb 1968, d/o John Henry & Marion, Marion Hamill Scott, John Henry Scott, Marion Scott & Gwendoline Elizabeth are all on the same headstone. Possible relations. Scott, John Henry, d. 11 Dec 1954, h/o Marion, Marion Hamill Scott, John Henry Scott, Marion Scott & Gwendoline Elizabeth are all on the same headstone. Possible relations. Scott, Margaret Hamill, d. 9 March 1944, Marion Hamill Scott, John Henry Scott, Marion Scott & Gwendoline Elizabeth are all on the same headstone. Possible relations. Scott, Marion, d. 27 April 1960, w/o John Henry, Marion Hamill Scott, John Henry Scott, Marion Scott & Gwendoline Elizabeth are all on the same headstone. Possible relations.